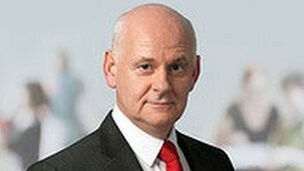 GARDAÍ believe Senator Jimmy Harte suffered serious head injuries as a result of a fall. The politician is in intensive care today after undergoing surgery in Dublin after being found unconscious in the city around 3am on Saturday. Gardaí have studied CCTV in the area around Newmarket Square where the Labour politician was found. Jimmy stays nearby when he is in Dublin and Gardaí believe he was was on his way there. They believe he was hurt in a tragic fall, perhaps hurting himself after taking ill.
An avid sports fan, and keen follower of Ireland, he had earlier watched Martin O’Neill’s side beat Latvia at the Aviva Stadium. The Senator has had health issues in the past but has always fought back, running marathons and raising money for good causes in the process. A Labour Party spokesman said his family are at his side at the Beaumont Hospital in Dublin. Senator Harte underwent surgery on Saturday evening. He remains seriously ill. The good wishes of many people in Donegal and throughout Ireland to the politician and his family have been posted on social media. Labour Party leader and Tanaiste Eamonn Gilmore has spoken with family members to offer his support. Padraig MacLochlainn TD said the thoughts of everyone in politics and in Donegal are with Jimmy and his family.